Citation Information: J Clin Invest. 2017;127(1):74-82. https://doi.org/10.1172/JCI88883. There are three dominant contributors to the pathogenesis of dysfunctional adipose tissue (AT) in obesity: unresolved inflammation, inappropriate extracellular matrix (ECM) remodeling and insufficient angiogenic potential. The interactions of these processes during AT expansion reflect both a linear progression as well as feed-forward mechanisms. 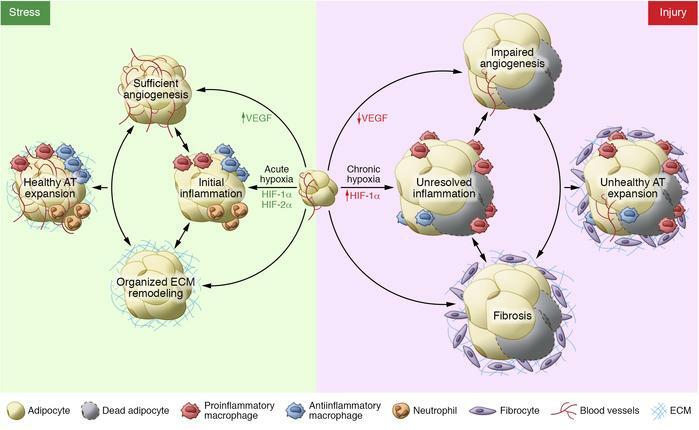 For example, both inflammation and inadequate angiogenic remodeling can drive fibrosis, which can in turn promote migration of immune cells into adipose depots and impede further angiogenesis. Therefore, the relationship between the members of this triad is complex but important for our understanding of the pathogenesis of obesity. Here we untangle some of these intricacies to highlight the contributions of inflammation, angiogenesis, and the ECM to both “healthy” and “unhealthy” AT expansion. The complex contributions of angiogenesis, inflammation, and fibrosis in healthy and unhealthy AT expansion. Hypoxia during early AT expansion induces stress signaling that facilitates angiogenesis via upregulation of an array of genes including VEGF, initiates inflammatory cell infiltration, and induces organized ECM remodeling to encourage appropriate AT expansion. However, persistent stress signaling translates into injury signaling, caused by long-term and severe hypoxia. This hypoxic condition fails to induce VEGF, resulting in impaired angiogenesis. Limited oxygen supply also triggers chronic low-grade inflammation predominantly characterized by proinflammatory macrophage infiltration. Upregulation of HIF-1α also increases the fibrotic program in AT. The integrated responses among those three factors promote significant hypotrophy in adipose tissue, and the consequence is an unhealthy AT expansion as well as obesity-associated metabolic consequences.